October 24, 2014 · 2:09 am.10. During yesterday’s rainstorm, which kept switching from drizzle to downpour, I decided to run my regular neighborhood route in an Iron Man mask. The mission: Determine whether I will be able to see and breathe during Sunday’s CHaD Hero race at Dartmouth College. 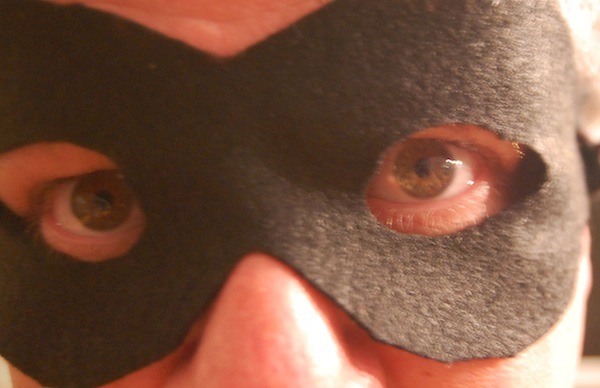 PROS — Mask shields face from rain and wind, blocks facial expressions so bystanders do not know if I am out of breath. CONS — Loss of peripheral vision, can’t see my feet, very difficult to scratch my nose. Overall, though, I was pleasantly surprised how much oxygen seeps through the eye holes and under the chin. I had no trouble breathing in this mask despite the tiny mouth and non-existent nostrils. I have no idea if I got any funny looks from the neighbors or passing cars because I am nearsighted and without my glasses I cannot see distant faces. I’m now ready for Sunday! The Garnick Justice League, in an historic first, recently began accepting superhero members from Marvel. 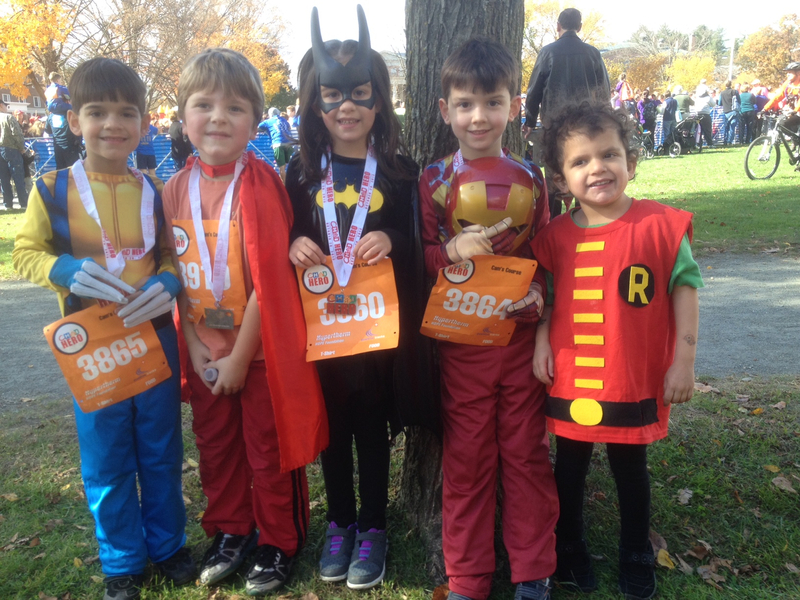 It’s not too late to support the Garnick Justice League‘s run for Children’s Hospital at Dartmouth (CHaD). Donations of any size would be most appreciated! POSTSCRIPT – The Stonehill College sweatshirt is a souvenir from when I produced a student recruitment video a few years ago. How pathetic is it that I no longer own a sweatshirt from my alma mater? September 10, 2014 · 2:09 am.09. No matter how worthy the cause, my rule is that you can only (aggressively) bang on the same friends’ doors for donations once a year. Go beyond that and they won’t be thinking of you as altruistic. They’ll stop taking your phone calls. 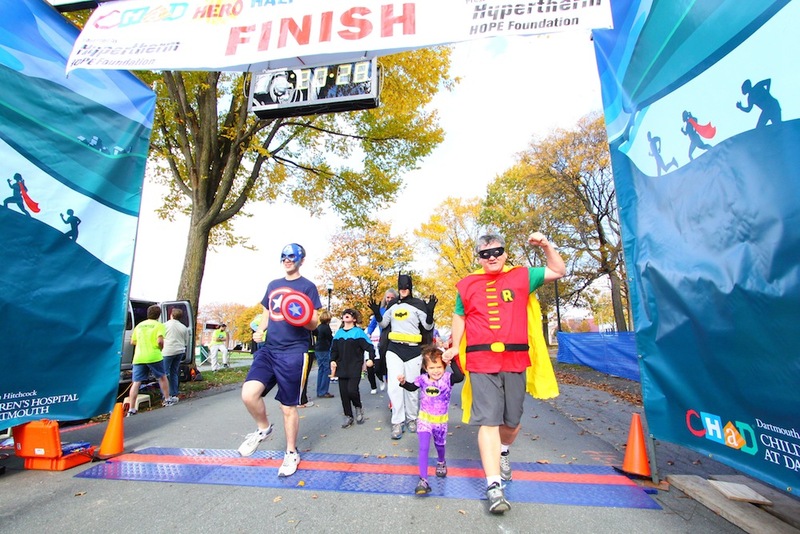 For the past four years, I’ve run in the Children’s Hospital at Dartmouth (CHaD) HERO race with my kids in superhero costumes. No parent ever wants to get to know the inside of a children’s hospital, and unfortunately, I’ve spent way too much time there. Having a strong personal connection to a charity — and sharing it — is probably the most effective fundraising approach possible. People that I’ve chosen to share my story with have been exceptionally generous. However, a few months ago, I also tapped deep into my network to support One Run For Boston, a fundraising race to help victims of the Boston Marathon terror attacks. This is an issue that’s surfaced with the soaring popularity of the ALS Ice Bucket Challenge. How can you pit one charity up against another? People only have so much to donate. How do you weigh the merits of helping a bombing victim with a prosthetic limb vs. a baby who needs to eat with a feeding tube? Again, you can’t ask everyone you know to support everything you care about or every charity event you participate in. Most of the time I resolve this by making a modest donation (whatever I can afford) to charity events I’m part of — or figure out how to contribute in volunteer hours — and don’t “bother” others. I’m making an exception this time. 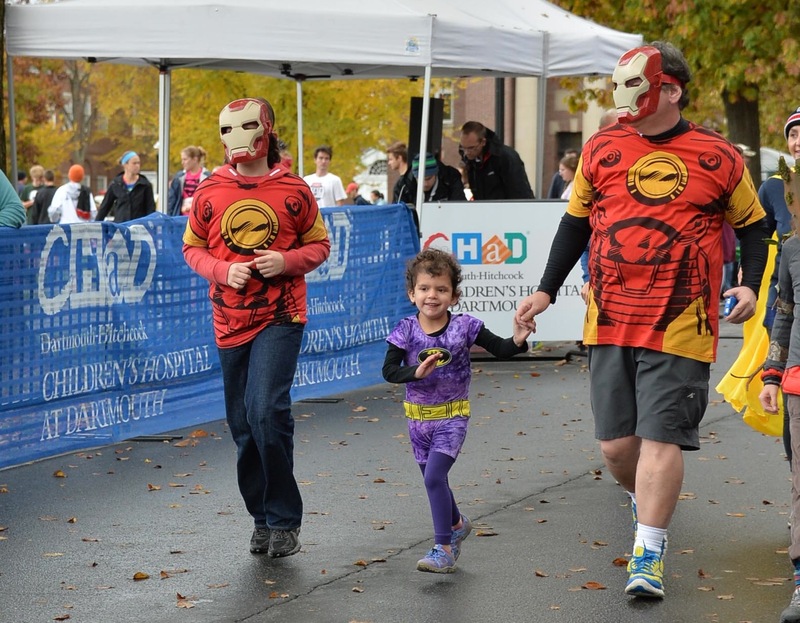 The superhero race is my way of expressing gratitude that I have to spend far less time in children’s hospitals these days. My family does not even use CHaD at all currently, but I want to support other parents who unexpectedly feel like they were smacked in the face with a brick. On a lighthearted note, one of my family’s most important decisions will be which heroes to be this year. 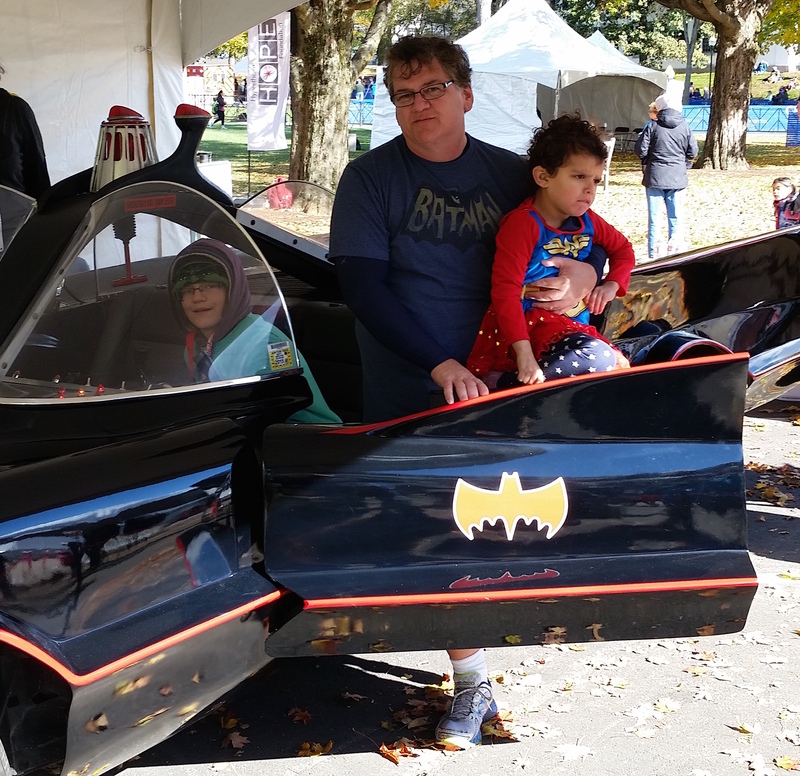 Last year, my son was Wolverine, my daughter was Robin the Girl Wonder, and I was Robin the Boy Wonder for the second time in a row. It’s time to retire the mask, but the Garnick Justice League will be coming back stronger than ever this year! Those of you who know my story can support us in the October 26th CHaD race at my team page. 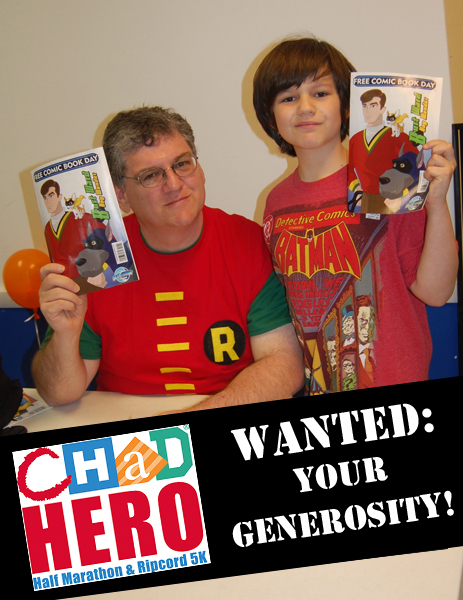 Those of you unfamiliar with CHaD or who are stumbling on my blog for the first time can still help an amazing cause. As for our new alter-egos… stay tuned!